"Known primarily for his expeditions Stéphane seeks to improve his climbing skills, and in this film, takes on some of the hardest routes in an area of Siurana known as El Pati (Catalan for ‘the playground’). Girlfriend Alizée is already a very successful climber and with the aid of friend and psychologist Olivier Rouquette (also the film’s narrator), the two take on some of El Pati’s most difficult climbs. 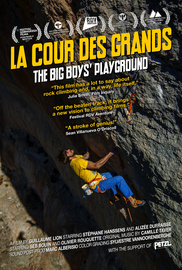 What sets The Big Boys’ Playground apart from other films about climbing is that it does not focus on the danger element, or the fear, or injury, or anything else that has made similar films of the past decade succeed. Instead, it looks at climbing as more of an intellectual puzzle, one with moves and timings, and precision. Reminiscent of a chess game, through Lion’s camera climbing is thoughtful, tactical, and for those watching, an incredibly mesmerizing, puzzle."